Apples and cranberries give this basic bread dressing fabulous fall flavor, and the sausage adds an extra dimension. Add 1/2 cup of pecans to the dressing for even more texture. Use this bread dressing to stuff a 12- to 14-pound turkey or bake it in a shallow baking pan in the oven. If you bake the stuffing in the turkey, make sure it reaches the minimum safe temperature of 165 F in the center of the stuffing. Even if the turkey is done, if it's stuffed it might need more time. Taste the stuffing and adjust the seasonings before you add the egg. Heat oven to 350 F. Butter a 9-by-13-inch baking pan. In a large skillet, melt butter; add onion and celery. Saute the vegetables, stirring, until just tender. Add sausage and cook, breaking the sausage up with a spatula, until cooked through. 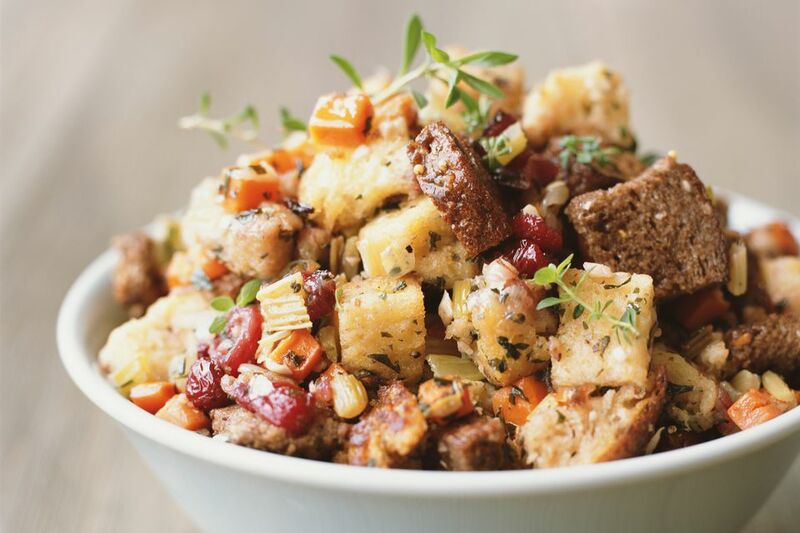 In a large bowl combine the vegetable and sausage mixture with the bread cubes and seasonings. Stir and add chicken broth until the crumbs are well moistened but not too mushy. Taste and adjust seasonings. Add the apples and cranberries then stir in the egg until well blended. Pat the dressing mixture in the prepared pan and cover tightly with foil. Bake in the preheated oven for 40 minutes. Remove the foil and broil the dressing just until lightly browned. Note: If using the dressing as a turkey stuffing, stuff the turkey just before roasting. When the turkey is finished (the stuffing must reach 165 F), let it stand for about 20 minutes, then remove all of the stuffing to a bowl to serve. Refrigerate leftover stuffing in shallow containers within 2 hours of cooking. Use half cornbread crumbs with the bread crumbs. Replace the sage, marjoram, thyme, and rosemary with 1 1/2 to 2 teaspoons of a poultry seasoning blend. Add about 1/2 cup of toasted pecans, chopped.